Is this Spain’s prettiest village? We would certainly argue that it is, despite the old amusing saying that Santillana del Mar is “The Town of Three Lies”, since it is set just inland, and isn’t flat or named after a saint. But what is undeniable is Santillana del Mar’s considerable charm – its ensemble of 15th -17th-century golden stone houses have survived largely intact, and the enchanting Plaza Major is as impressive and awe-inspiring as any in Spain. Santillana del Mar grew up around a monastery and subsequently the 12th-century Church of the Colegiata, which is probably one of the most beautiful in Cantabria. Once an important pilgrimage center, this magnificent piece of Romanesque architecture houses the tomb of the local early-medieval martyr St Juliana or Santa Llana, from which the village takes its name. Therefore, the history of Santillana de Mar prior to this point is unclear, although a settlement may well have existed before the monks founded their monastery. As far back as 800,000 BC, Cantabria was inhabited by hunter-gathers and then Neolithic farming communities. 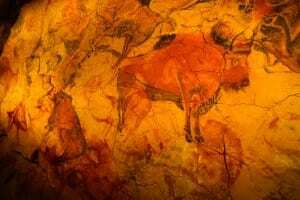 Remnants of this fascinating past can be seen today – the nearby cave of Altamira is filled with drawings and handprints dating back over 20,000 years. The Phoenicians were the first foreign settlers to arrive in Spain, landing in approximately 1100 BC, followed by the Greeks and Carthaginians. Invading Celts mixed with native Cantabrian tribes, providing a formidable force against the Romans, the next Conquerors of Spain. Controlling the Iberian Peninsula for centuries, they divided it into three provinces: Tarraconensis, Lusitania, and Baetica. In time, cities with Roman infrastructure developed into important outposts of the Empire. However, it was not to last – after the collapse of the Western Empire in the 5th Century AD, the Visigoths invaded Spain and made Toledo their capital. They, in turn, were supplanted by the Moors, who arrived in 711. But if there was a settlement at Santillana de Mar during this period, it is unlikely to have been significantly affected by the Moors’ conquest of Spain. The Berber armies never managed to subdue Cantabria and the Christian reconquest of Spain is said to have begun in 718 when a Moorish force was defeated in the Picos de Europa. In the 9th century, a monastery was built on the site of modern-day Santillana del Mar, which historians believe was constructed in 870. 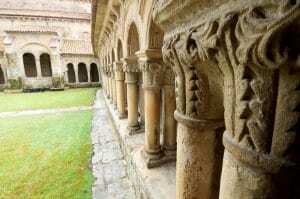 Over the course of the 11th century, it was transformed into a collegiate church and Santillana del Mar became an increasingly important religious center in Cantabria. However, the buildings visible today date back to the 12th century, a time when the Moors controlled Al Andalus (southern Spain) and Christian kingdoms in the north were fighting a fierce war against militant North African Muslims – Almoravids and Almohads. As they pushed further south, soon only Granada remained under Muslim control. That city was retaken by the Catholic Monarchs Fernando and Isabel in 1492. Meanwhile, Santillana de Mar benefited greatly from Columbus’ discovery of the Americas and the subsequent trade with Central and South America. Today, a stroll through the village’s cobbled streets reveals magnificent houses built by noblemen. These have either fine wooden galleries or iron balconies, and coats of arms inlaid into their brilliant stone facades. This period was rightly known as Spain’s golden age, which saw the flourishing of literary and artistic achievement. Sadly, though, it was not to last. Carlos I and his son Felipe II spent much of Spain’s newfound wealth on battles to halt the spread of Protestantism in Europe; the 17th century was a time of economic deterioration and ruinous wars with the Low Countries. Nevertheless, Santillana de Mar was largely unaffected by the political and social turbulence of the 18th and 19th centuries. The power of the Bourbon Monarchs in the 1700s was at its height during the reign of the enlightened despot Carlos III; by 1873 Spain had embraced democracy and declared its first Republic. However, it lasted only a year and consumed four presidents. The late 19th century was a time of national decline, with anarchism developing in reaction to rampant political corruption. The loss of Cuba, in 1898, was a low point for Spain, although there was a flurry of literary and artistic activity in the following years. Spanish politics was becoming polarized and in 1931 Alfonso XIII was forced to abdicate and the ill-fated Second Republic was declared in 1931. Nationalist Generals rose against the government in 1936, starting the Spanish Civil War. The Nationalists, under General Franco, were halted by the Republicans outside Madrid, but with support from Hitler and Mussolini, they inched their way to victory in the north and east. Cantabria stood with the Republic but it was to no avail – on 1 April 1939, Franco declared the end of the war and demanded unconditional surrender from the Republicans. Many people were executed in reprisals, although Franco is credited with keeping Spain out of the Second World War II. After his death in 1975, Spain enjoyed a swift and painless transition to democracy. Yet despite this considerable amount of social and political change, a visitor to the village today would scarcely be able to tell which century they were inhabiting. Modernity, or perhaps even history it seems, has bypassed the picturesque medieval village of Santillana del Mar. It is a historical masterpiece, a perfectly preserved piece of antiquity that has been handed down through the generations, and is still governed by town-planning laws created in 1575. The cobblestone streets, flower-filled balconies and inviting cafes – this is a village that demands to be explored, at a very slow pace. Cantabria’s incredible beauty is matched only by its culinary treasures. Hidden within its mountain scenery, with its green upland meadows, bubbling streams, and fruitful valleys is a plethora of fantastic produce – game, venison, wild boar and, of course, the finest cattle offer a feast of delights for meat lovers. The abundance of wild berries, chestnuts, walnuts, edible flowers, and herbs is the icing on the cake as if visitors needed a second reason to explore to majestic Picos de Europa. A mild sunny climate enables grape vines and fruit trees to flourish – the land of ample produce also presents visitors with wild salmon and milk-fed lamb. Cantabrian veal, fattened on the high mountain pastures is another guilty pleasure. Meanwhile, the Cantabrian coast is dominated by dishes based on fresh fish and seafood. Indeed, the fresh and processed anchovy specialties from Laredo, Santona, and Colindres have a formidable reputation throughout the whole of Spain. But it is the subject of cheese that really arouses local passions. 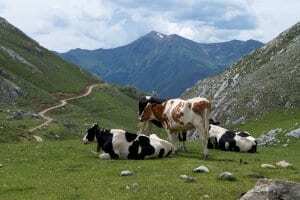 For centuries farmers have made their living from the dairy industry, handsomely situated across the green meadows of the Picos de Europa. Sheep and goats’ milk is also important and many of the best cheeses are produced from three-milk blends. Our favorite is Picon, a three-milk blue cheese from the mountains of the Picos de Europa. Exquisitely creamy and tangy, it was historically wrapped in leaves. Quesucos is another brilliant cheese, made from a mixture of milk or individual types of milk – it comes in plain or smoked varieties. The smoked Aliva and the fresh buttery Cantabria are also justly celebrated, as is Cobreces, made from cows’ milk by the Cistercian monks in the Santa Maria de Viaceli monastery. Cider (Sidra) must also not be omitted from this discussion. On the Atlantic coast of Northern Spain, over 30 different varieties of apple (manzana) thrive in market gardens, maintained by the same family line for generations. Small, sour varieties of crab apple give the cider its structure, while sweet and bitter varieties add all-important flavor and texture. Sidra natural is fermented using a natural process without any artificial elements, while Sidra gasificada is manufactured with the addition of carbonic acid and sugar. You’ll find plenty of excellent examples in siderias or cider bars, where locals like to joke: “We may have lost paradise because of the apple, but we’ll get it back with cider.” Served from on high into traditionally large glasses, it is said that the full potential of the flavor only develops at the moment it falls into the bottom of the glass. Salud! A superb example of Romanesque architecture, this very beautiful church houses the tomb of St Juliana and contains a 17th -century painted reredos and a carved south door. Special mention must go to its lovely cloisters and their vivid depiction of biblical scenes which have been sculpted on the capitals. Prepare for a fascinating tour of geological formations unique to this part of the world. The Cave of Soplao (blown) was discovered at the beginning of the 20th century, so named because of the draughts that blow through the cave. The most important passageways are La Gorda (The Fat One), Los Fantasmas (The Ghosts) and La Opera (The Opera). A charming village, Comillas is renowned for its legacy of buildings created by Catalan Modernista architects. Antonio Lopez y Lopez, the first Marquis of Comillas, hired Joan Martorell to design the Palacio Sobre-Llano (1881), a huge Neo-Gothic edifice. However, Comilla’s best-known monument is Gaudi’s El Capricho, designed for a rich businessman. It is a Mudejar-inspired fantasy with a minaret-like tower covered in green and yellow tiles. These beautiful mountains were reputedly christened the “Peaks of Europe” by returning sailors for whom this was often the first sight of their homeland. The range, now Europe’s largest national park, is ideal for hiking and the terrain is astonishingly diverse. In some parts, deep winding gorges cut through craggy rocks while elsewhere verdant valleys support a profusion of flora and fauna.